Through the weather turmoil of 2017, Texans got a taste of what is likely their new normal: severe fluctuations between intense rainfall and drought. The recent climatic whiplash is a reminder of how important it is that water conservation remains a priority in the minds of both the public and decision-makers. Truly, the next drought is just around the corner, as is continued population growth – a dangerous combination that stretches Texas’ finite waters thinner still. If we want the best for our state’s future, we need to make sure we have enough water for healthy, vibrant communities of people and wildlife. We can prosper if we take care of the rivers, creeks and bays that define and sustain the state, people and natural heritage that we know, love, and need. That’s why we recommend that municipalities adopt permanent irrigation restrictions that limit outdoor watering to no more than two days per week, at a minimum. This report explores why permanent irrigation restrictions are a critical tool for saving water, as well as the potential statewide savings under successful programs that emphasizes education and enforcement measures. Click here to read the full Water Conservation by the Yard (2018) report, or continue on to read the need-to-know report highlights. There’s no doubt that water conservation must play an integral role in providing for Texas’ future. Of all the water management strategies proposed by the 2017 State Water Plan, water conservation is easily the most cost-effective and the least environmentally-damaging. 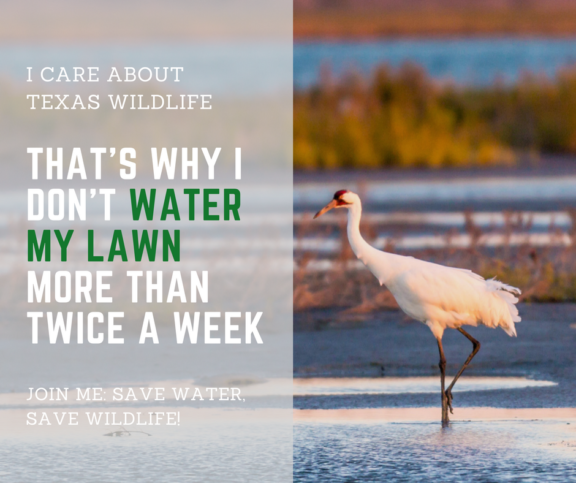 Water conservation doesn’t just help cities use their existing water supplies more wisely; it also saves taxpayers money and protects Texas’ beloved natural resources. And while Texans deserve a hearty pat on the back for the many strides we’ve already made in conserving water, we still have work to do. There are many opportunities for cities and Texans to step up their conservation game, starting outside. 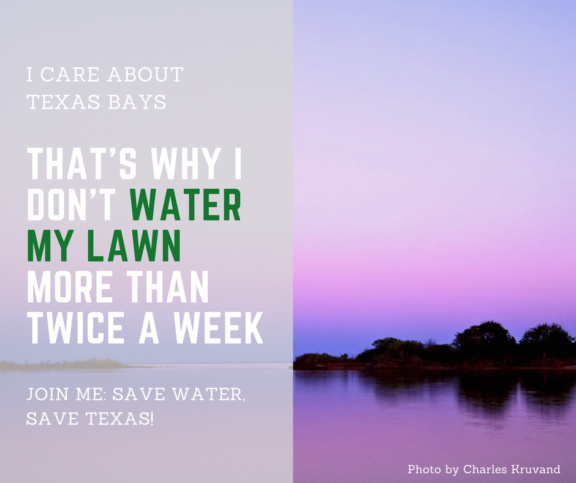 Texas can save a lot of water and still have healthy landscapes by adopting more efficient outdoor watering practices. Landscape irrigation is estimated to be the single largest component of municipal water use, and municipal water is the second-largest water-using sector. Picture this: The amount of water that single-family households in Texas currently use to water their landscapes could fill 590,000 football fields, each with one foot of water. Plus, there’s clear room for improvement: studies show that homeowners tend to overwater landscapes by as much as two to three times the amount actually needed. Did you know? If your yard has at least six inches of soil, once-a-week watering is enough to maintain its appearance in Texas. Even during hot and dry Texas summers, landscapes only need about an inch of water per week, whether from rain or irrigation. Find out how much water your lawn needs. How much can we save with twice-per-week watering? The scale of outdoor water use in drought-prone Texas is massive. A significant percentage of highly treated, drinkable water – not to mention the expensive infrastructure required to deliver that water – is put on our lawns. Because landscapes can survive and thrive with lower watering amounts and frequencies than they are commonly given, outdoor watering restrictions that limit outdoor watering to no more than twice per week can reduce total municipal water usage by as much as 11 percent. The push towards permanent outdoor watering restrictions also comes in line with demographic and housing trends in recent decades. Texas is home to the fastest-growing cities in the nation, and with this growth comes burgeoning housing markets across many parts of the state. Because these housing preferences drive higher outdoor water usage, we need to curb excessive outdoor water use now more than ever before. Click here to see a regional breakdown of potential water savings. Each of these regions can cut down on their water use by at least two percent when they implement these outdoor watering restrictions, even if these programs don’t have strong education and enforcement measures. With stronger levels of education and enforcement, some regions can cut water use by more than 22 percent. Statewide, Texas can cut around 8.9 percent of its current municipal water use – enough to fill 381,839 football fields, each a foot deep with water – if its municipalities implement effective city-wide outdoor watering restrictions with strong education and enforcement components. Texas will need additional water supplies in the future to keep pace with a growing population and its water demands. If Texas communities can reduce their water use, we eliminate the need for costly additional water supplies. This is a win for everyone. To see outdoor watering restrictions in action, click here to view case studies or click here to read our draft ordinance. Did you know? Dallas, Austin, Frisco, Fort Worth and the Woodlands already use permanent outdoor watering restrictions as a part of their water conservation strategies. Whether you’re a utility, community leader or a concerned Texan, you can help save Texas water. 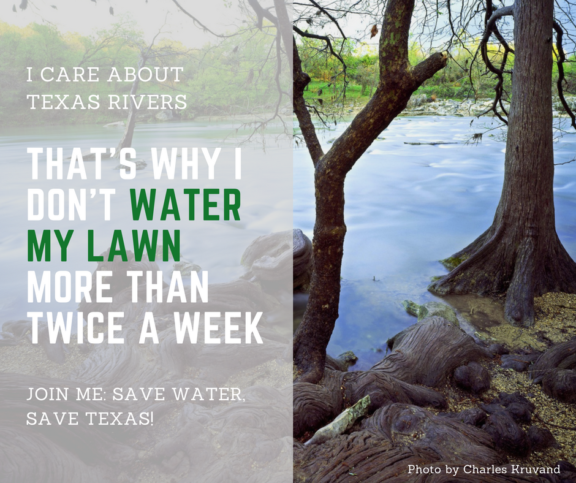 Here’s how you can help Texas cut down on unnecessary water use. You can help by championing the implementation of no more than twice-per-week outdoor watering restrictions. To learn more, read the full Water Conservation by the Yard (2018) report. If you have questions, don’t hesitate to contact the Texas Living Waters team. We are happy to answer questions or help with ordinance implementation. If you own a home or workplace with a lawn, you don’t need to wait for an official ordinance to start making a difference. Commit today to only watering your lawn once or twice a week at most. Pay attention to things like rainfall – some weeks, it may not be necessary to water your lawn at all. If you’re on social media, don’t stop there. Share your commitment with your friends by downloading one of the below graphics (click an image to view it full size, and then right click and save to your desktop) and posting it on your social media page. Encourage your connections to join you in saving water for a strong Texas future. 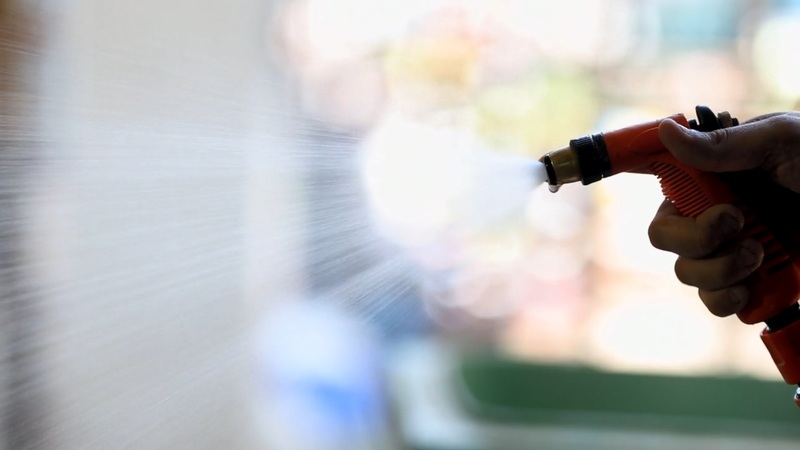 If you have a phone or internet connection, you can encourage your municipality leaders to adopt outdoor watering ordinances that limit watering to no more than twice a week. Not sure what to say? 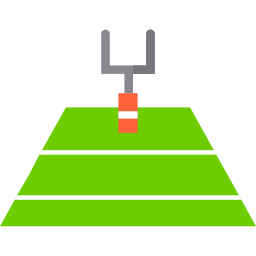 Use this email script as a template or as inspiration. My name is (your name) and I live in (your city/community). I’m reaching out because I am concerned about our city’s long-term water supply. It is important to me that our community prioritizes common-sense water conservation measures that save water for people, wildlife and our future. As you may know, landscape irrigation is estimated to be the single largest component of residential water use. This is a great opportunity for our community to cut down on unnecessary water use. I urge you to consider permanent outdoor watering restrictions as a cost-effective way for our community to conserve water.